Congratulations to the Great Britain Palma Rifle Team (GBPRT), winner of the 2015 ICFRA World Long Range Palma Team Championship match. The British team shot superbly, winning by 70+ points over runner-up Team USA. 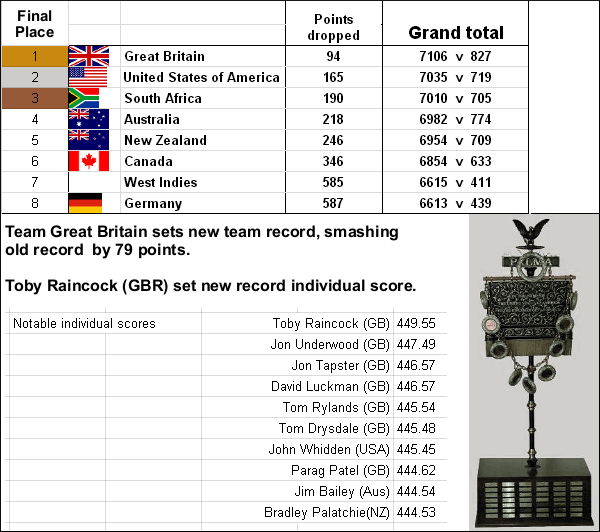 Great Britain’s 7106-827V score* set a new Palma Team Championship record, smashing the old record by 79 points. The British marksmen displayed stunning accuracy — Team GB had fully 102 more Vs than did the second-place American squad (A “V” is the equivalent of an “X” in American scoring). The Brits shoot great as a team. Consider this — Great Britain had eleven shooters with 50 or more V-bulls. Team USA had just three. Match record beaten by 79 points – 7106.827 (176 V-bulls more than last time*). Individual record beaten by 3 points – 449.59 (Toby Raincock). Highest 900-Yard Aggregate score – 2384.276. Most consecutive Palma Team matches won – Four in a Row. First team ever to win ALL six ranges. NRA Palma Team Match Bulletin (Team Results) | CLICK HERE for Complete Team Results Spreadsheet. The top individual shooter in the Team match was Great Britain’s Toby Raincock, who dropped only one point over two days to finish with 449-55V, a new record individual score that will be very hard to break. The next best individual score was the 447-49V by fellow Brit Jon Underwood. The top American shooter was John Whidden, who finished with a 445-45V. The GBPRT website summed up the big victory as follows: “It was a glorious day for GB and more statistical analysis would tell you more of the depth of our victory[.] We won big and we were justly proud of years of hard work. The celebrations immediately after the match were wonderful and full of the beauty of our sport. All the teams gathered and shook hands. The runners up USA and South Africa were valiant fighters and all teams showed their appreciation for not only a great match but also a great win. 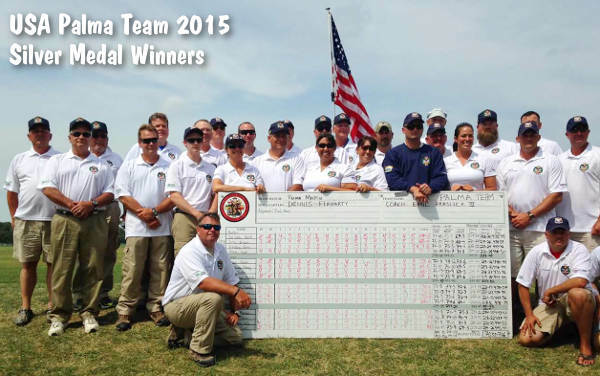 The American team shot very well in finishing second, breaking the previous Palma Team match Aggregate record in the process. Team USA enjoyed a significant 25-point margin over third-place South Africa. John Whidden had a great match, finishing as the seventh-highest shooter overall. Team USA member Kelly Bachand praised his team-mates and coaches: “I am extremely proud to have contributed to the USA’s silver medal in the 2015 Palma Trophy match. I feel very blessed to have been counted a member of this elite group of shooters and coaches.” Team USA’s shooting members included: Kelly Bachand, SFC Shane Barnhart, Tyrel Cooper, Mark DelCotto, SSG Amanda Elsenboss, Trudie Fay, Michelle Gallagher, SFC Brandon Green, Norman Houle, Bryan Litz, Kevin Nevius, Kent Reeve, Justin Skaret, SGT Eric Smith, Nancy Tompkins, John Whidden, (SFC Russ Theurer and Wayne Budbill alternates). Dennis Flaharty was Team Captain, SFC Emil Praslick III was head coach, Robert Mead was adjutant, and line coaches were: Norm Anderson, Ray Gross, Steve Hardin, Gary Rasmussen. *The previous record score was 7027-651V set in Brisbane, Australia in 2011 by Team Great Britain. NOTE: the NRA Bulletin lists Great Britain’s Final Score as 7106-825V, rather than 7106-827V as noted on the GBPRT website. We don’t understand the discrepancy, but we will list the higher total until we receive clarification. Share the post "Rule Britannia! 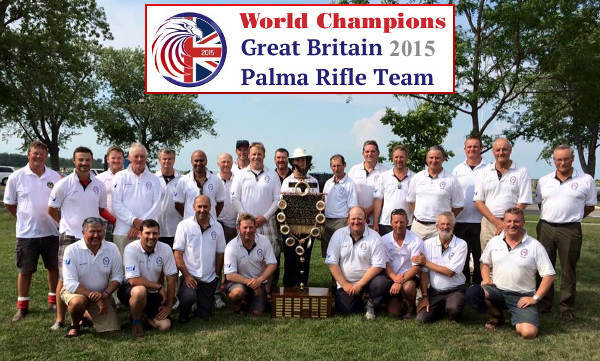 Team GB Wins World Palma Team Championship"
More guns… more guns than ever. That’s what U.S. gun-makers have been cranking out. According to the latest BATFE Fireams Commerce Report, American gun manufacturers produced over ten million guns in 2013, the last full reporting period. That’s an all-time record. The 2013 total of 10.885 million guns produced in 2013 represents a 27% increase over the 8.579 million guns made in 2012. What’s even more surprising, the 2013 total is nearly double the quantity product just three years before in 2010 — 5.459 million firearms. 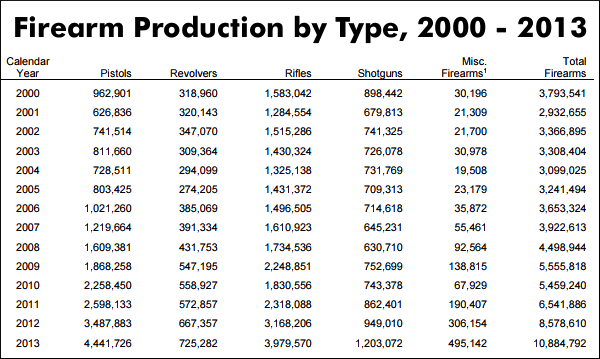 Any way you look at it, that’s a huge increase in firearms production in a very short time. As a category, pistols (primarily semi-auto, and not counting revolvers) have seen the largest increase in production, rising from 662,973 in 1986 to 4,441,726 in 2013. Notably the number of wheelguns produced has actually declined from 761,414 in 1986 to 725,282 in 2013. In recent years there has been a significant growth in the number of shotguns sold, due to increased consumer interest in scatterguns for sport and defense. The number of shotguns sold topped did break the million mark in 2013, rising from 949,010 in 2012 to 1.203 million in 2013, and increase of 27%. There has also been a significant growth in NFA items sold over the last dozen years, lead by a huge increase in the number of suppressors. In fact, as we reported last week, from 2014 to 2015, the number of NFA-registered suppressors rose from 571,150 to 792,282. That’s a 39% increase in just one year! There are now nearly 800,000 suppressors now registered in the USA. The BATFE Report, officially the Firearms Commerce in the United States Annual Statisical Update 2015, also included data on firearms imports and export. Notably, more than 3.6 million firearms were imported into the USA in 2014. Of those 2.1 million, or 58%, were handguns (pistols and revolvers). Share the post "Huge Increase in U.S. 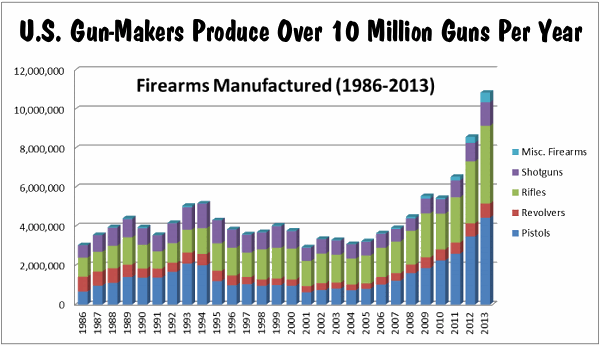 Gun Production in Recent Years"